S&S Towing was started by Steve Smith Sr. in September of 1998 with one 1989 Ford wrecker, which was followed by a brand new international flatbed in the upcoming December. Steve Smith Jr. joined in January of 1999 after being laid off for winter as a gravel train driver and as the business was starting to pick up. It seemed as though people were so starved for good service in our community that the business escalated very quickly. By year 2000, S&S Towing had purchased an additional flatbed and another heavy wrecker. 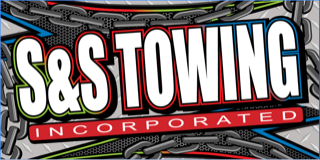 In 2001, S&S Towing purchased yet another new flatbed and started to grow the business that started with just two employees. The “Big Red Trucks” was derived largely from the need to create a new marketing strategy to generate business due to the fall of the economy in 2008. We thought a catchy slogan would help people remember us. Our trucks were red and something all of us heard before on a regular basis from customers was “you know, those guys with the big red trucks”, so it stuck. We also feature our trucks upside in advertisements. These days we are all bombarded with hundreds of ads, so we thought it would be fun way to get people to remember our ad. What does customer service mean to Steve Smith Jr? “I think most people use it as a buzz word these days. I like to call customer service, integrity. It’s how you do something when nobody is watching. I am a “do the right thing” kind of person even if it puts me in an uncomfortable situation, takes longer, or costs me more money. I think our customers see that and I get respect for that. Customer service is how you treat people, not what makes your bottom line grow. We are a small business in a small community, and I am ok with that. I don’t need to be the biggest company, I just like helping people, making a difference in someone’s life. That’s what drives me to do this job (however my wife says I just like playing with trucks, which may be part of it)”.